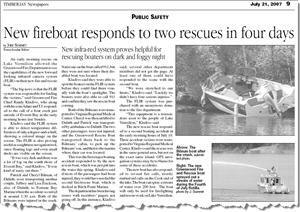 Here's an interesting news article , in.PDF format, about how the Greenwood Fire Department used the capabilities of their new forward looking infrared camera system (FLIR) on their new FireBrand 28 fire and rescue boat in a recent rescue. "The big news is that the FLIR system was responsible for finding the victims," said Greenwood Fire Chief Randy Kladivo, who along with his sons Adam and T.J. responded to the call of a boat crash just outside of Everett Bay in the early morning hours last Sunday. It was a dark and foggy night. Here, from May 24th 2007, is more news about Greenwood's new fireboat. Need a quote? See our pre-quote checklist first.